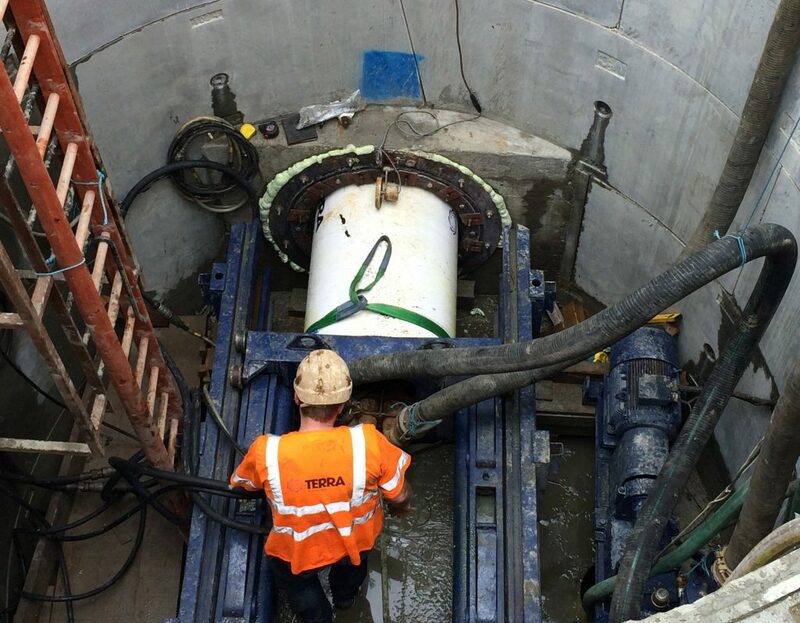 When Thames Water needed to construct some new pipework as part of the Crabtree Road Flood Alleviation Scheme in Camberley, they enlisted the help of Terra Solutions- the Trenchless Experts. This tunnel was to be built using the Microtunnelling method, and using pre cast 600mm concrete jacking pipe, and was to run to a total drive length of 35m. Complicating this project was the overhead presence of the local railway, which the tunnel had to cross. The borehole reports for this project indicated that while the tunnel horizon would be comprised of sand, gravel and river deposits, there would also possibly be clusters of boulders or cobbles which would affect the project. With uncertainty about the ground conditions, and an active railway still running directly overhead, Terra Solutions got to work providing peace of mind for the residents of this high flood risk area. Plant was mobilised on a number of flatbed lorries and transported to site. These arrived on site in a predetermined sequence according to the site traffic management plan, where they were unloaded in the order set out by the lifting plan by a 22.5T mobile crane. A 75mm layer of concrete blinding was cast so that the jacking rig could be established. A thrust wall was constructed behind the rig, and the space between this and the shaft wall was filled with grout. As this concrete was compressed, there was no need for reinforcing fibres. The rig was set to the correct line and level for drilling to commence. The Portal Seal Assembly was then bolted to the headwall, with the 850mmØ opening providing space for the Herrenknecht AVN 600 remote control full-face slurry tunnelling machine to pass through. With the drive shaft already constructed, Terra were charged with breaking out the necessary 850mmØ hole in the shaft wall, breaking through reinforced concrete, bolts and fixings to create this opening. With the control cabin put in place beside the drive shaft, tunnelling could commence, passing through a rubber gland in the portal that creates a watertight seal. This gland has an internal diameter (ID) which is smaller than that of the TBM, Terra Team members in the control cabin monitored the readouts, ensuring the TBM remained on target, guided by the shield mounted laser. As the machine was pushed forward by hydraulic rams, engaging the TBM with the ground, the slurry system removed arisings from the tunnel. This slurry was pumped to a separation plant on the surface. This TBM used steel “slug” cutter teeth with inserts made from tungsten carbide- known for being twice as dense as steel- and had different heads that could be attached depending on the ground that was encountered. The result of this project was a brand new 600mmØ tunnel, crossing directly underneath the main railway line in the region, built exactly to specifications provided. With all the necessary credentials to work on the most complex UTX projects nationwide, this was a perfect example of Terra Solutions’ expertise at work in a high pressure environment. 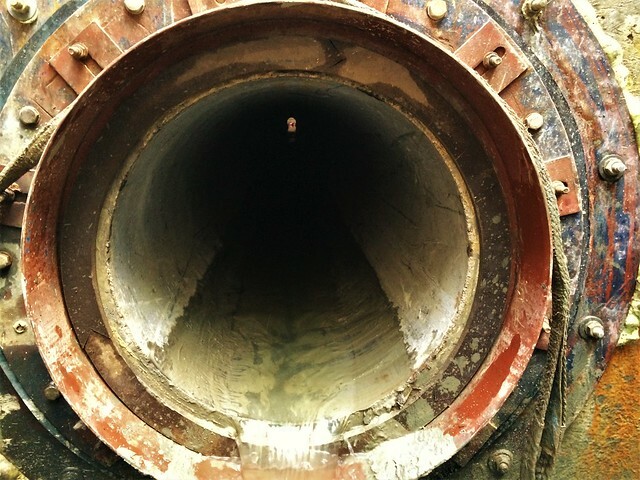 Find our other Microtunnelling projects here.